Geological data show that the region of Central-west Bulgaria is characterized by the presence of active deformations and modern seismic activity. The southern region of Sofia shows a complex tectonics formed by the intersection of several active faults. The concentration of seismic activity is mainly located in the south-southeast parts of the region as a result of the geodynamic processes. The seismicity of the Sofia area is of particular interest because of the great activity and the proximity to the city of Sofia, so it is necessary to carry out the research of crustal movements in the area. In Frank’s method (Frank, 1966) stresses are calculated by the angular rotation of two mutually perpendicular axes, and tensions are assumed to spread equally in space. This method applies to triangular measurements in two or more epochs. The method requires different epoch measurements to have the same network configuration. In a different network configuration, the Prescott method (Prescott, 1976) is applied. This is a widespread method, which assumes that tensions spread equally in both space and time. However, this method does not produce good results in the presence of heterogeneous data. The Simultaneous Reduction Method (Bibby, 1982) estimates the velocities gradient by assuming that the gradient is a constant throughout the network. The advantage of these methods is that they evaluate unambiguously the desired parameters. These result in a spatially averaged velocity field. Another alternative approach is to eliminate the assumption of a spatially unified velocity gradient and to estimate the velocities of the points directly. Combining terrestrial measurements with GPS makes it possible to obtain a unique velocity field, and can combine different terrestrial networks to obtain a unified solution. Several studies have shown that such technique is applicable (Snay and Drew, 1989, Grant, 1990). We use the method described by Dong (Danan Dong, 1993) for the calculation of stresses in the earth’s crust using theoretically stringent, practically efficient and flexible techniques for combining heterogeneous data. Point positions are estimated as a function of time and also the field of velocities is obtained from different types of measurements at different times and in different network configurations. 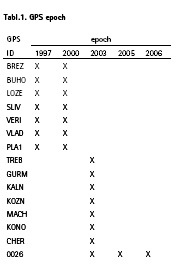 For the study of active tectonic in the region several epochs of GPS measurements are used as shown ot Table. 1. The processing of GPS measurements has been done with the Bernese software version 4.2 (Bernese GPS software version 4.2). Coordinates of permanent stations used in the processing fix the coordinate and kinematic systems. In the study of the modern movements of the Earth’s crust, interest in calculating velocities of the points, the accumulated strain and the magnitude and directions of the rotation in the network (Dimitrov N. 2013) (Dimitrov, Georgiev 2011). The principal strain axes and the sizes and directions of rotation in the network of elementary triangles have are calculated with FONDA (Forward Observation and Network Deformation Analysis) software. From the analysis of the results it is clear that rotations in the triangles north of the Iskar fault zone (northwest to southeast) are clockwise and those in the triangles located to the south of the fault zone are counter-clockwise. The difference in these directions, similar to result for strain and shows the existence of modern activity in the area. It may used to clarify the geological and tectonic environment. The obtained result for horizontal velocities, strain rate and rotation rate are in line with the overall north-south extension of southern Bulgaria and northern Greece – the South Balkan Extensive Area (Burchfiel et. All, 2000). Frank, F.C. (1966). Deduction of earth strains from survey data, Bull. Seismol. Soc. Am., 56, 35-42. Prescott, W.H. (1976). An extension of Frank’s method for obtaining crustal shear strains from survey data, Bull. Seismol. Soc. Am., 66, 1847-1853. Bibby, H.M. (1982). Unbaised estimate of strin from triangulation data using the method of simultenous reduction, Tectonophysics, 82, 161-174. Snay, R.A. and A.R. Drew (1989). Combining GPS and classical geodetic surveys for crustal deformation in the Imperial Valley, California, High Precision Navigation – Integration of Navigational and Geodetic Methods, Springer-Verlag, New York, 225-236. Grant, D.B. (1990). Combination of terrestrial and GPS data for Earth deformation studies, Ph.D. Theses, Unisurv report S-32. Dong, D. (1993). The horizontal velocity field in southern California from a combination of terrestrial and space-geodetic data. PhD Thesis, Massachusetts Institute of Technology, 157pp. Burchfiel, B. C., R. Nakov, T. Tzankov, L. H. Royden. 2000. Cenozoic Extension in Bulgaria and Northern Greece: the northern part of the Aegean Extensional Regime.- In Tectonics and Magmatism in Turkey and the Surrounding Area (E. Bozkurt, J.A. Winchester and J. D. A Piper, eds. ), Geol. Soc., Sp. Publ. 173, 325-352. 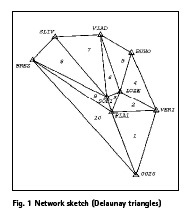 Dimitrov N.(2013), Contemporary crustal movements from GPS and triangulation data. Bulgarian Geophysical Journal vol. 39, pp3-8, ISSN 1311-753X. Dimitrov N., I. Georgiev (2011). 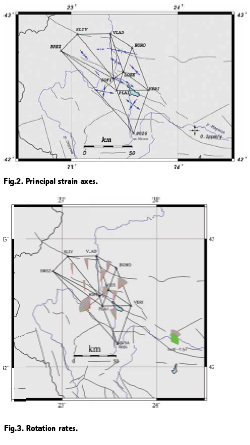 Determination of crustral strain from GPS data in central-west Bulgaria region. Proceedings, VSU L. Karavelov 2011, vol 2, VI 147-151. FONDA – Forward Modeling Network Deformation Analysis (FONDA) Software Version 3.1, MIT, February 2001.